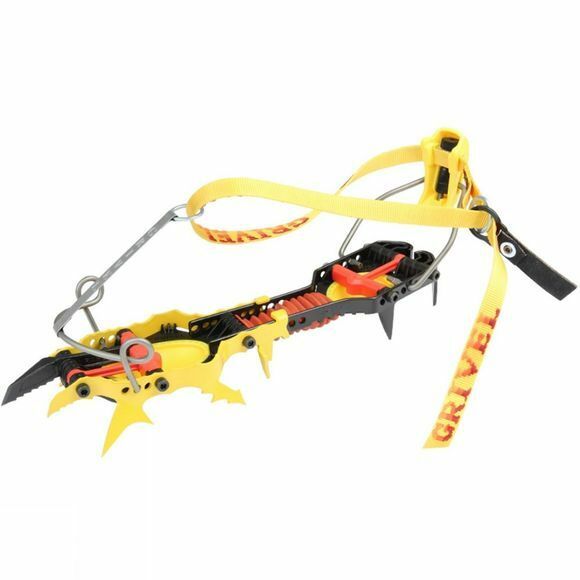 Our range?s most technical crampon is now at its fourth evolution, integrating Grivel?s active anti-balling plate and simplifying all adjustments: just one screw to adjust the length, just one screw to substitute a point, just one screw to position the spur. Rigid crampon with anatomic curve. Asymmetrical forged mono-point, extremely easy to substitute with just one screw, integrated with a half point external lateral support point: a new solution for external support. Structure in rigid plastic acts as a spacer for the screws and as support for the supple rubber anti-balling device. Accordeon in supple rubber holds together the front and rear parts of the anti balling system. Four retention points for descent. Moveable spur.